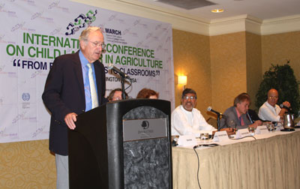 The First International Conference on Child Labour in Agriculture was opened by Senator Tom Harkin (D-Iowa). Pathbreaking conference to tackle the urgent problem of child labour in agriculture. Organized by the Global March Against Child Labour, a worldwide movement of NGOs, trade unions including teachers trade unions. Senator Harkin said the campaign on child labour in agriculture had started with DENIAL, moved onto AWARENESS-raising, and now was the time for more action leading to ABOLITION. The three day conference is being attended by 160 participants from 40 countries with representatives from the governments, international labour and development organizations, trade unions, employers organizations, corporations, multi stakeholders initiatives, national and international coalitions. Senator Tom Harkin said that the fight against exploitative child labour should be the centrepiece of all the development financing from the IMF and The World Bank. All financing commitments from the international financial institutions should be critically linked to credible commitments from the national governments to provide economic and social protection to the poor and ensuring each child is brought to schools from the farms and fields. He further added that we need less military spending and more schools with substantial increases in hiring of the teachers to meet the critical shortages of trained and well-paid teachers in every classroom. The South African representative the “Let me be a child” campaign, with meetings held in Limpopo province expressly to highlight the problem of child labour in agriculture. 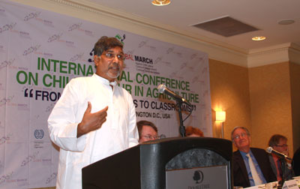 Mr. Kailash Satyarthi, Chairperson Global March expressed anger, anguish on the slow progress made in elimination of child labour in worst forms. He said that 2016 deadline to eliminate worst forms of child labour is fast approaching and we do not have a results based plan for each country. He also expressed the dissatisfaction on the poor support to the civil society to have the means to compel the national governments in monitoring their efforts and keeping the national attention focussed. He said the fight against child labour is weakened if there is no commensuration support to strengthen the global movement against child labour. He also demanded from the multinational corporations not to hide behind some modest initiatives on CSR so as to escape attention from their poor institutional ability to monitor prevalence of the exploitative child labour. He also said that the Corporations cannot place the blame on supply chains being effectively out of their control and excuse, deflect attention from their responsibility. He said that the respect to the laws of land, core international labour standards, engaging civil society in monitoring of the supply chains and going deeper in to the issue of exploitative child labour should be their prime responsibility. Geronimo Venegas, Vice President of the IUF trade group representing the workers, called for better ties with agricultural trade unions. The fight against child labour cannot be realised without closer collaboration with the farmers’ organisations. Fred van Leeuwen, Secretary General, Education International affirmed the commitment of the 30 million strong members of the Union in the fight against child labor in agriculture and demanded time bound action plan for providing schools in rural areas and commitments from the national governments to fill up the 8 million teacher vacancies so that each rural school could be provided with teachers if the goals on child labour in worst forms has to be met by 2016. He appreciated the initiative from the UN Secretary General Ban ki Moon on creating a special group to focus on coordinating various UN agencies work in the field of education and expressed hope that this group will be able to address the problem of the 67 million children who are currently missing out on primary education. Constance Thomas said that all the participants were “engineers in the process of eliminating child labour.” She highlighted the problem of hazardous child labour, and the fact that developing countries use 25% of the world’s pesticides but have 99% of pesticide poisoning facilities. For the conference, her major question was “how can we make greater progress in eliminating child labour, especially in agriculture?” She called for broadening advocacy, enhancing visibility, and strengthening law and enforcement, and hoped that the discussions at the conference will represent a significant staging post between The Hague and Brasilia conferences.